When it comes to Halloween and autistic kids, parents need to be clear-headed, creative, and flexible, and prioritize our kids' needs and stamina. So, if you're in the market for Halloweening advice, let me dump some on your head, courtesy of personal experience, friends' adventures, the Internet, and the Twitterverse. Does your child find the entire concept of Halloween overwhelmingly frightening? Then sit down with your child and read as many books about Halloween as you can, talk about what kinds of activities may be available, agree ahead of time which activities your child will participate in and to what degree, and reassure them that they can opt out of anything, any time (and then weave behind-the-scenes spells to ensure that your promise holds). Do you think your child will enjoy trick-or-treating, but are worried it may not be appropriate for them? If they tire or get scared by unpredictable things easily, then plan a limited route close to home, or have another adult trail your crew in a getaway car. If your child has limited mobility or is in a wheelchair, scope out your trick-or-treat route ahead of time so you can note non-accessible houses and avoid them. Does your child have sensory issues that make Halloween a horror show of overwhelming strobing lights, loud noises, and scary, unpredictable decorations? Skip trick-or-treating, and instead plan a sensory-friendly Halloween party. If your house isn't the right spot, rally a group of parents and ask a local church or school to donate party space. A dedicated party also allows parents with children on specific diets—or those who prefer to sidestep sugar bombs—to plan appropriate menus. Do sensory issues also limit Halloween costume choices? Are scratchy seams, tags, and headgear all deal-breakers? 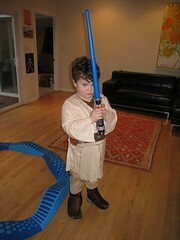 Consider pajama-like costumes without headgear, like Superman or Supergirl, or Jedi knights. If your child does martial arts, let them wear their uniform. If they want to go trick-or-treating but don't want to wear a costume, then who cares—let them wear their regular clothes. Is your child disinterested in Halloween? Then don't force them to participate in Halloween traditions unless they want to. Instead, stay home and do something your child will enjoy, and look forward to. Is your child now "too old" for Halloween? No, they aren't, not if they still want to participate. While there are some spaces, like some bouncy house pumpkin patch parks, that won't allow in people over a certain age for safety reasons, activities like trick-or-treating should be fine for those who are polite but firm about their (or their child's) desire to delight in the seasonal fun. 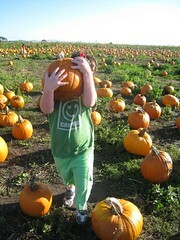 Our family has many Halloween traditions: we go to our favorite local Pumpkin Patch before Halloween. It's not the fanciest pumpkin environment, nor does it have bouncy houses, inflatable slides, or train rides. What it does have is a huge open field of pumpkins, a old truck for climbing and jumping on, a hay bale pyramid for surmounting, and endless running around opportunities for my son to hang out and groove with other kids in the pack-like manner he prefers. Good luck, friends. Have a safe, happy, and fun Halloween, and do send me any leftover candy. A version of this essay originally appeared at BlogHer.com in 2010. It has been updated as of October 30, 2018.